← We are pushing to get to Berlin- six days to go ! 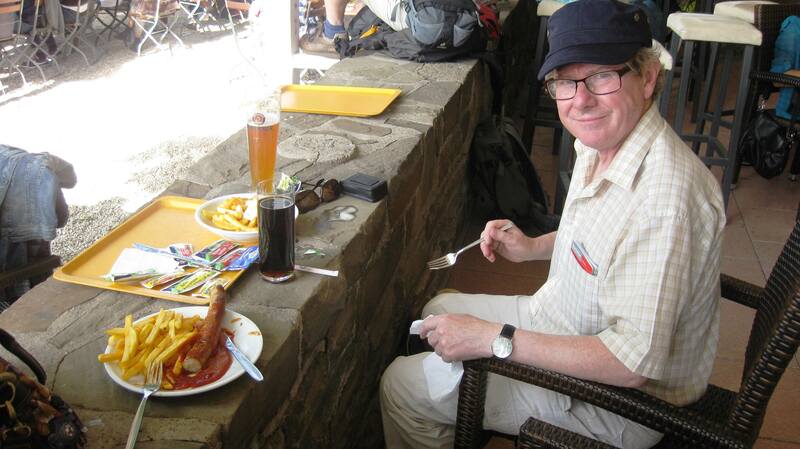 We have been in Germany nineteen days now and our first impressions are below…. After spending almost three months in France, and with Nuala having such good French, we were worried about moving to Germany. But as I reminded Nuala, the challenge of the Gap Year was to get from Paris to Berlin and we had to get out of our new comfort zone and keep going. So what are our first impressions! Firstly, we are surprised how few Germans, that we meet at the marinas, speak English. Yet in the shops, in the larger cities, the younger people all seem to have some English. This is quite understandable as we have not seen any English or Irish boats in Germany. They mostly get Dutch and Swedish visiting boats. Most of the time, people think our Irish flag is the Italian flag! We were trying to find out in the boat club in Schierstein, how to get by bus into Mainz city centre. We tried to ask the Bootsmann (boat man) but he had no English. We approached a group of people in the club having a drink and asked if anybody could help us. A younger woman said she had a little English and tried to help. Then from the back of the room, an elderly man answered in perfect English and told us where and which bus to take. It is remarkable how helpful German people are. In Worms we went into the Media Market store to buy a German phone and internet connection. The staff were extremely helpful and looked for the staff member who had better English, made sure we got the right package for our requirements and then loaded up the credit on the phone for us. They kept saying they were glad to help. Germans want to get the task done and will go the extra bit to make things work. 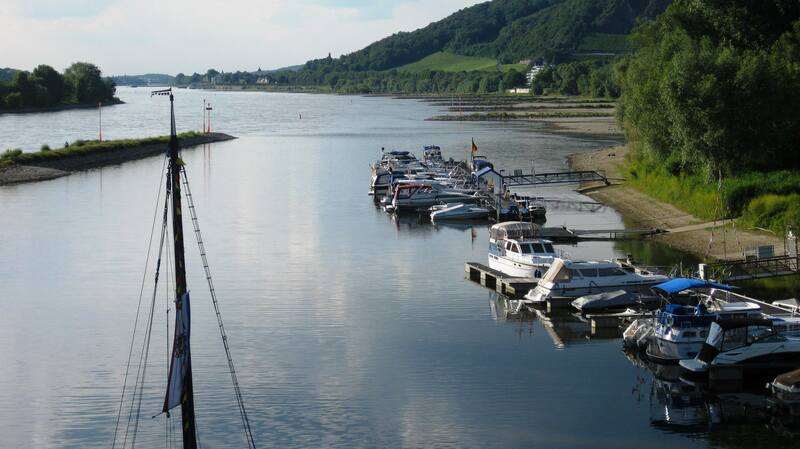 Also when we decided to stay at a Marina in Bad Honnef, I turned in off the Rhine and headed for the pontoons checking the depth of water. Suddenly a voice came on the radio saying “Recht Recht”!! I did not know if it was meant for us or not but I stopped the boat. Then in good English a voice said “white boat stop and move to the right as no water on left. Stay on the right side”! At that moment I felt the bottom of the boat gently ground. 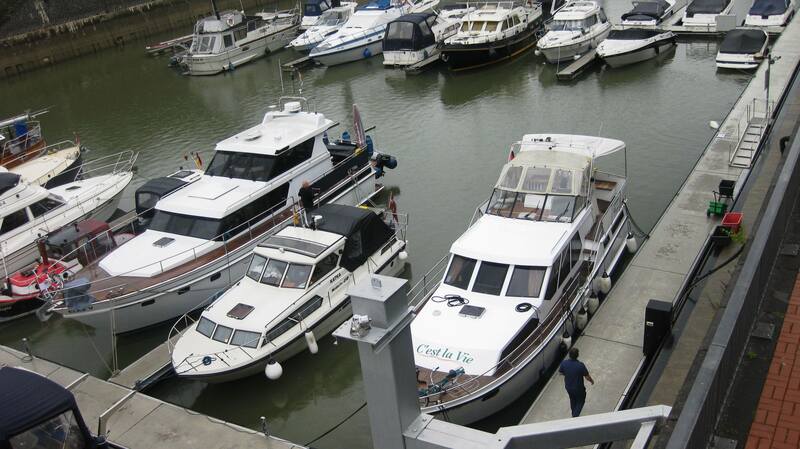 Then we saw a lady waving to us and shouting how to get to the pontoons. It turned out that the water levels on the Rhine had suddenly dropped and you had to follow a specific channel (only known to the locals). If she had not gone to all effort to contact us, we could have done serious damage to the boat. Then she met us on the pontoon, told us where everything was and asked if we wanted to see Germany playing against USA that night. 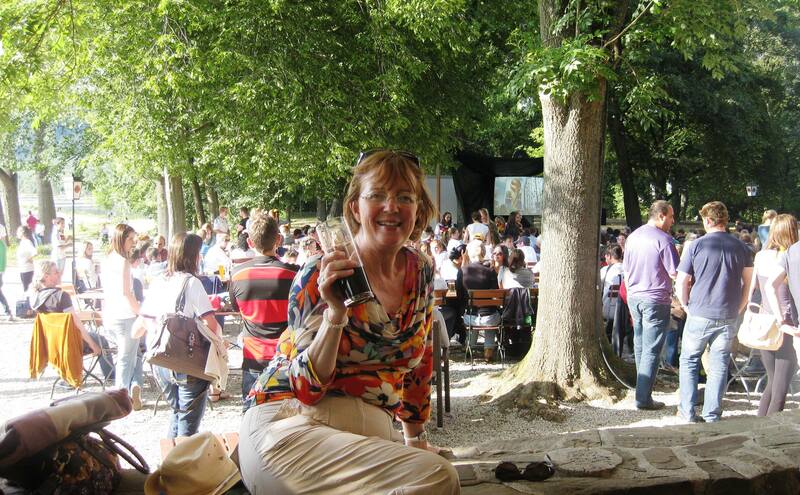 She then told us how to get to a big beer garden on an nearby island that had a big screen and good food. We went that night and had a great time. This is only one example of many, where German people have gone out of their way to help. Shopping in Germany seems to be cheaper than Ireland. I was in a DIY store in Worms called OBI. It had a hugh range of fittings, tools, washing machines, kitchens etc. I could have spent all day there and the prices were very reasonable. For example, I bought a soldering gun and it was only €7.99. In Worms city centre there was a great range of shops and Nuala bought a very nice dress for €40. Again staff in shops are very helpful and there is no pressure selling. If you think Aldi and Lidl are cheap in Ireland you should try Penny or REWE in Germany! I am sure as we head towards Berlin we will learn a lot more about Germany. This entry was posted in comments on life, Experiences on the Canals, On the Journey, People We have Meet on the Gap Year, People who have helped us on our way, Places visited and tagged Bad Honnef, Berlin, Bootsmann, DIY stores in Germany, Friendly German people, Germany versus USA world cup 2014, impressions of Germany, Mainz, OBI, Penny, REWE, Schierstei, Worms. Bookmark the permalink. i love to get your blogs,i have a 40ft dutch steel , and would love to hear more about app, day to day running costs, mourning/basics.